This is very cool to add a bit of zing to your photographs. 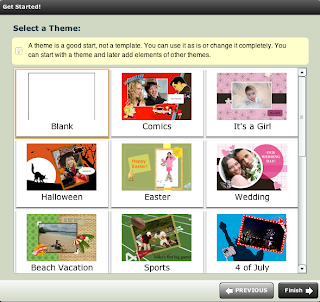 With it you can add frames, borders, text boxes and stickers. First of all you need to register like always use the same gmail and password to keep things simple. 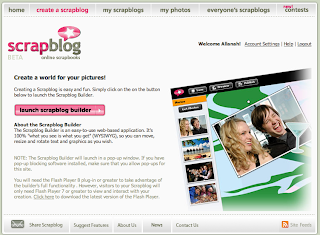 Once that is done launch the scrapbook builder. 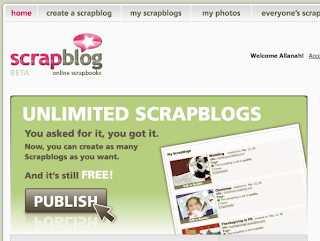 Give this particular scrapboog and name and an URL should you want to look at it separately from your Blogger blog. Decide whether you want to make it private or public. 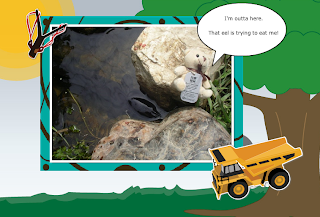 Now get some photos to add to the theme you have selected. Click on the Get Photos link in the top left hand corner. You can collect them from your Flickr account directly if you have one or upload the photos in batches of three if you want. 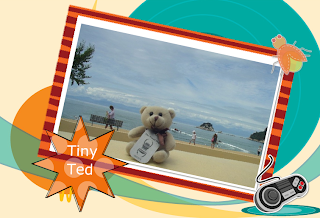 Again I have reduced the size of the photos in iPhoto to 500 whatevers to make the uploading process quicker. 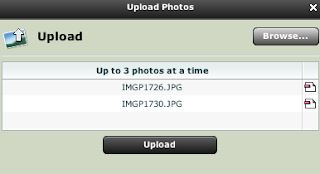 You can upload another batch of three or not. Then add them to your scrapblog. To get the photos into the frame just drag them. You will have to resize them and fiddle around a bit with the layering of the text, photos and frame but all the menus are on the right hand side and it is pretty easy to work out. Now I go APPLE, SHIFT + 4 all at the same time and drag the crosshairs where I want the screen capture to be and I have like a photo of the screen. 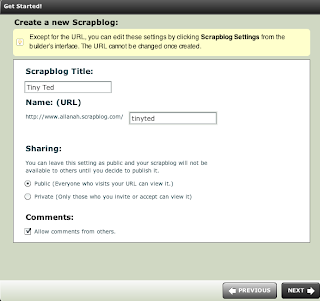 I then upload that to Blogger in the usual way. On a PC you probably need to click the PRINT SCREEN key and drop it into the image editor to crop it to the desired size. Isn't that very cool with a bit more bling! 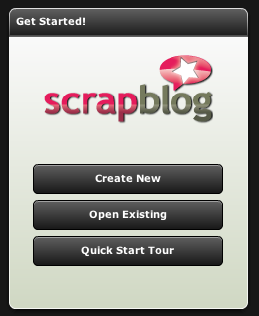 It is almost like a free on-line version of Photoshop with templates- a good way of introducing the concept of layers.